Irvine, CA - June 27, 2016 - VIZIO, Inc. the #1 Smart TV company in the U.S. (1), announced today the Canadian launch of VIZIO SmartCast, its next generation smart entertainment ecosystem that transforms how users discover and control their home entertainment. 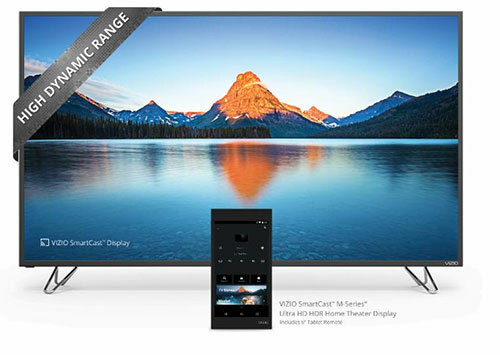 VIZIO SmartCast comes to Canada with three all-new collections: the P-Series™ and M-Series™ Ultra HD HDR Home Theater Displays and E-Series™ Ultra HD Home Theater Displays. Each new model fully integrates Google Cast™ technology and is controlled by the intuitive VIZIO SmartCast app that turns any smartphone or tablet into a powerful touchscreen remote. Rolling out online through Costco Canada, the collections start at an MSRP of $1,499 for the P-Series 50" class size, $3,199 for the M-Series 70" class size and $1,299 for the E-Series 50" Ultra HD class size. The VIZIO SmartCast ecosystem represents a paradigm shift in smart home entertainment by turning every mobile device screen into a remote control. Available for download, the new VIZIO SmartCast app transforms iOS or Android mobile devices into powerful touchscreen remotes capable of controlling any VIZIO SmartCast device in the home. Rather than struggling to see and adjust settings or navigate apps from across the room, VIZIO SmartCast app users have easy access to all menus and playback controls right from their mobile screen. Each VIZIO SmartCast model, regardless of collection, also ships with a standard IR remote control, giving consumers an alternative way to control basic functions of the display. "We're excited to bring the all-new SmartCast home theater display collections to Canadian consumers. The new VIZIO SmartCast ecosystem finally brings home entertainment into the mobile era, providing consumers with advanced navigation, search and control of their display from any mobile device," said Matt McRae, Chief Technology Officer, VIZIO. 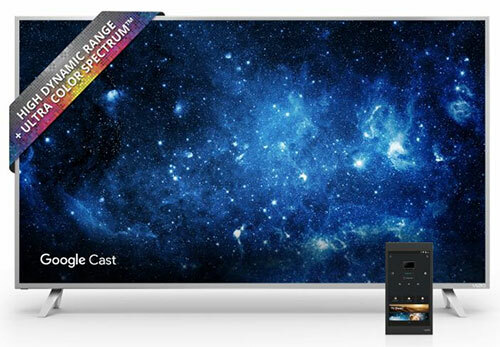 "Highlighted by the P-Series, which sets a new benchmark for picture quality with High Dynamic Range and Ultra Color Spectrum™ technologies, the SmartCast ecosystem fully integrates Google Cast technology, giving consumers access to a wide-array of movies, TV shows, music and more." The VIZIO SmartCast P-Series Home Theater Display models offer Ultra HD featuring High Dynamic Range with support for Dolby Vision™ content. The P-Series also boasts Ultra Color Spectrum enabling a wider color gamut for impeccable accuracy in every hue and tone. These technologies transform the entertainment experience with dramatic imaging, incredible brightness, contrast and color that brings content to life. A powerful Full-Array LED backlight with up to 128 Active LED Zones® dynamically adjusts to on-screen content for deeper, richer black levels and more accurate contrast(2). The VIZIO P-Series also allows consumers to control their entertainment experience like never before with an included 6" Android Tablet Remote. The tablet remote features a convenient wireless charging dock and comes pre-installed with the VIZIO SmartCast app, allowing consumers to browse and play content with simple tap, swipe and voice-based controls. The Android Tablet Remote accompanying P-Series offers Full HD 1080p resolution, a powerful V8 octa-core processor, integrated stereo speakers, and 16GB of storage, making it a great standalone tablet as well for watching videos, playing games and more. 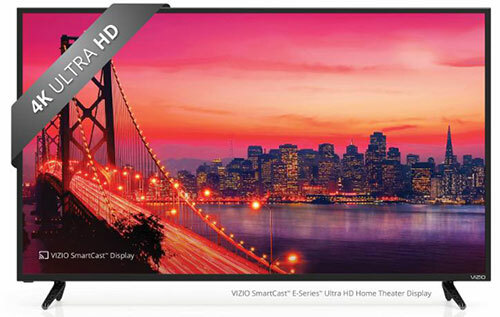 Next in the VIZIO SmartCast line-up is the M-Series Ultra HD HDR Home Theater Display collection.. In addition to Dolby Vision content support, the M-Series also features Full-Array LED backlighting with up to 64 Active LED Zones, doubling the amount of zones when compared to the award-winning 2015 M-Series collection. Like the P-Series, the M-Series ships with a 6" Android Tablet remote, featuring 720 HD resolution, 8GB of storage, integrated stereo speakers and a quad-core processor. For consumers looking for an uncompromised value, the VIZIO SmartCast E-Series collection offers brilliant picture quality and other features not typically found in entry level displays. The E-Series Ultra HD models offer four times the pixel resolution of 1080p Full HD and Full-Array LED backlighting with up to 12 Active LED Zones. For HD entertainment, VIZIO's Spatial Scaling EngineTM and VM50 Ultra HD Engine upscales the image to Ultra HD resolution for a beautiful viewing experience. To access smart entertainment features, E-Series users simply download the VIZIO SmartCast App to their mobile devices to discover content and control their displays. All VIZIO SmartCast displays come with Google Cast built in, which enables consumers to stream content from thousands of mobile apps they already know and love. By simply tapping the Cast button, consumers can easily watch content go from their mobile screen to any VIZIO SmartCast display connected to their home WiFi network. When streaming over WiFi, users can multi-task on the M- and P-Series included tablet remote, or their own mobile device, without interrupting what is casting on the display. VIZIO SmartCast Ultra HD Home Theater Displays are also tuner-free. The displays come with an included HDMI cable so they are able to connect to high-definition devices like cable/satellite receivers, Blu-Ray players and gaming consoles just like traditional TVs. For consumers that use an external antenna or "rabbit ears" to watch local over-the-air broadcasts, a separate third party digital converter box tuner will need to be purchased to connect to the display via HDMI. For more information on the VIZIO P-Series Ultra HD HDR Home Theater Display, M-Series Ultra HD HDR Home Theater Display or E-Series Ultra HD Home Theater Display models, visit VIZIO.ca. 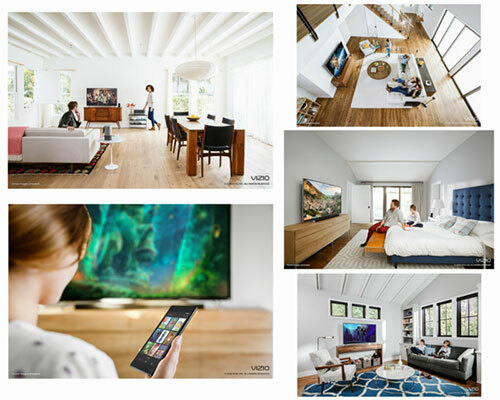 VIZIO's mission is to deliver the ultimate entertainment experience through our community of connected consumers, advertisers and media content providers. Through our connected entertainment platform, VIZIO is transforming the way consumers discover and experience media content. Since our founding in California in 2002, VIZIO has built an industry-leading brand and sold over 65 million products, including televisions, sound bars and other devices. VIZIO has achieved significant U.S. market share and held the #1 unit share position in the U.S. sound bar industry (1) and is currently #1 unit share for all TVs (2) and #1 unit share in Smart TVs (3) in U.S. VIZIO product leadership is highlighted by a number of industry reviews and awards including a 2015 CNET Editors' Rating of 4 stars for a review of our E-Series Smart TVs (4), 2015 Editors' Choice award from Reviewed.com for our M-Series 4K Ultra HD Smart TVs (5) and Sound & Vision's Top Picks of 2014 for 42" and 54" Home Theater Sound Bar Systems. For more information, please call 888-VIZIOCE or visit www.VIZIO.com. © 2016 VIZIO, Inc. VIZIO, the V Logo, VIZIO SmartCast, Home Theater Display, Active LED Zones and other terms and phrases are trademarks or registered trademarks of VIZIO, Inc. All other trademarks and logos are property of their respective owners. All rights reserved. 1The NPD Group/Retail Tracking Service, sound bar units sold in the U.S., January 2013-December 2015.